At my home institution, some know me as a writer or performer, mostly through slam poetry. I knew I wanted to continue it in some capacity while abroad and I actually found a slam team at the local college but unfortunately, they only spoke German. After that, I decided that the best way to keep writing was to do just that, keep writing, and confine my spoken words to a sheet of paper. This is the mini series of short poems that I have crafted this semsester along with photo accompaniment. Less is truly more. is this what the motherland would look like if our streets were still paved with gold? I thought about writing an article entitled "A Stroll Through the Land of My Father's Colonizer" but I never got around to confronting those demons. I wrote this poem instead, after trips to Paris and Nice (pictured), places I enjoyed so much but felt so guilty. I have always wondered what it would be like to visit France as a first generation Haitian-American, and I thought that maybe I would get past everything but ultimatley the history of colonization has still left a bitter taste in my mouth. Maybe I should write that article after all. I haven't experenced any overt racism here but I have recieved a fair share of looks and questions. I chose to caption one of my pictures from Warsaw's square with this poem because it was the most interesting place to be Black. By this I mean that diversity-wise, the only people I saw that looked even remotely like me were members of my IES Abroad cohort. I have felt welcomed in every place I've been to, but sometimes it's hard to accept that welcome when people view you as being out of place. This one hurt. I felt this one, and I feel it now just writing about it. I wrote this poem in my mind while walking through the streets of Venice alone, and realizing that I was doing something my mother and I have talked about for years. Years. Sometimes, confronting your own privilege is the hardest part about being abroad, and I cried during that walk as I confronted mine for the first time since leaving for Germany. Members of my family have not been given the same opportunities I have. I know I should be grateful, and I am but it hurts, especially when you walk through a city that your parents and grandparents have wanted to visit since before you were born. My life's goal is to take them. what will my excuse be? 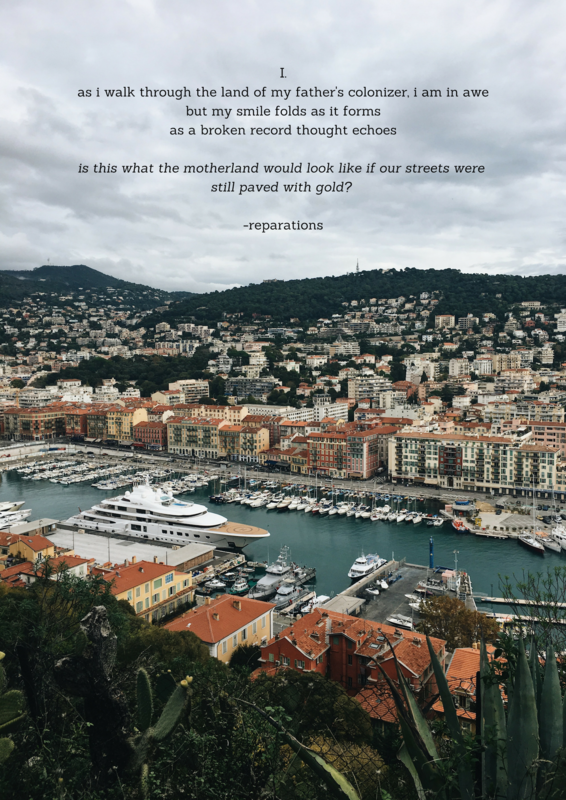 This poem was supposed to go with a picture of Monte Carlo, easily the richest place I've ever been to but alas, my iPhone seems to have magically deleted those pictures, so I settled for Rome. As I people watched around Monte Carlo, money oozed out of every door, every car, every window. Even the cracks in the sidewalk seemed to be filled with rubies while my pockets were light as a feather. I went to the port there and watched the giant yachts being cleaned by people with my complexion and wondered who owned them. I promised myself that one day I will come back here and rent one of these yachts, maybe for a weekend, a day, an hour, a minute just to know what it feels like. I do not know what my post-graduation future holds and while I don't aspire for yachts in Monte Carlo, I do aspire for stability. My slouch will go away once I don't have to think of the world in dollar signs.